Tissue, cells or virus corresponding to Human Melanoma. BALB/C mice were injected with extract of pigmented malanoma metastases from lymph nodes. IHC-P: Human melanoma and testis tissue. Our Abpromise guarantee covers the use of ab787 in the following tested applications. IHC-P Use a concentration of 0.5 - 1 µg/ml. Formalin-fixed, paraffin-embedded human melanoma tissue stained with ab787 at 1 μg/ml in immunohistochemical analysis. Formalin fixed paraffin embedded human melanoma stained with ab787, using ABC and AEC chromogen. 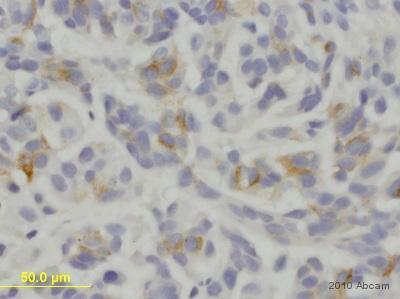 Formalin-fixed, paraffin-embedded human testis tissue stained with ab787 at 1 μg/ml in immunohistochemical analysis. ab787 staining Melanoma in the human Melanoma cell line WM3248 xenopraph by IHC-P (formaldehyde-fixed paraffin-embedded sections). Tissue samples were fixed with formaldehyde; permeabilized with 0.1% Triton X-100 and blocked with 100% Dakocytomation X0909 for 1 hour at room temperature; antigen retrival was by heat mediation in Citric buffer (pH6). The sample was incubated with primary antibody (1/25) at 4°C for 18 hours. An HRP-conjugated Goat polyclonal to mouse IgG (1/100) was used as secondary antibody. Overlay histogram showing Malme-3 cells stained with ab787 (red line). The cells were fixed with 80% methanol (5 min) and then permeabilized with 0.1% PBS-Tween for 20 min. The cells were then incubated in 1x PBS / 10% normal goat serum / 0.3M glycine to block non-specific protein-protein interactions. The cells were then incubated with the antibody (ab787, 1/10 dilution) for 30 min at 22ºC. The secondary antibody used was DyLight® 488 goat anti-mouse IgG (H+L) (ab96879) at 1/500 dilution for 30 min at 22ºC. Isotype control antibody (black line) was mouse IgG1 [ICIGG1] (ab91353, 2µg/1x106 cells ) used under the same conditions. Acquisition of >5,000 events was performed. This antibody gave a positive signal in Malme-3 cells fixed with 4% paraformaldehyde (10 min)/permeabilized in 0.1% PBS-Tween used under the same conditions. Publishing research using ab787? Please let us know so that we can cite the reference in this datasheet. I was wondering how long the product is stable for 4 degrees? This is not stated on the certificate of compliance. We don't have strict guidelines for length of storage for antibodies. In general, for antibody products stored at 4 degrees C, we would expect them to be stable for at least one year from date of purchase. Merci de nous avoir contactés; ma collègue m'a fait part de votre appel. Je suis heureux de savoir que l'anticorps a finalement fonctionné en cytométrie en flux. J'ai compris que vous deviez utiliser beaucoup d'anticorps pour obtenir des résultats satisfaisants sur 300.000 cellules. J'ai donc mis en place l'envoi d'une unité gratuite d'ab787 pour que vous puissiez terminer vos travaux avec cet anticorps. Le numéro de la commande est ****. N'hésitez pas à nous contacter de nouveau si vous avez d'autres questions. Inquiry: Hi, I'm looking at this product: Anti-Melanoma antibody [HMB45] (ab787) Do you have a protein/peptide that this antibody recognizes? I need to use the protein/peptide in my experiment as a positive control. Otherwise, are you able to recommend an antibody/antigen pair that can be used in this way? It doesn't have to be HMB45 strictly any human melanoma marker will do. I've been looking also at S100 in your catalog but I don't know which antibodies/proteins are compatible. Thanks. Unfortunately, the blocking peptide for ab787 antibody is not available for purchase. We have ˜25 anti melanoma antibodies available but we do not have antigen available for any one of these however if you could select few as per your requirement then I will check with our collaborator laboratory if they can supply the peptide as special request. We do have antibody / antigen pair for S100 protein. Please check the catalogue number ab14688 and ab30380.